Five bullet points to get more direct bookings. Luckily, it’s never too late to change the game. Prevent giving more power to OTA’s, stand up and act to get more direct bookings. It’s that simple. Yes, you will have to find a budget to do new things, some so very new, that you are afraid to use them. But if you don’t move, your hotel will become a game tool in the hands of the OTA’s. This time is essential for hotels to think about digital marketing and to win back some of the grounds they lost. If your website is hard to find in Google and direct bookings are decreasing, you have to admit this can only get worse. Hotels and OTA’s both created wrong expectations: “any hotel will always offer on-line rooms and services for the lowest price.” Ok, maybe you do this for only 30% of your rooms. Now what if an OTA overbooked your hotel? You get extra stress at the front desk plus a bad review online. Of course, the guest was unhappy, but who gets the blame of bad management? Exactly. OTA’s will not invest in the relationship with your hotel or support your services; they only invest into software to beat the search engines and the competition. They might lower their commission rates 2,5%. But only in return for extra booking power and flexibility. We understand that you can’t live without OTA’s; you got used to the easy way bookings come in, and that commission invoice, well that became part of the structural overhead costs. But OTA’s are hungry for more. The latest trend is that they try to make an online booking experience more personal. If OTA’s know more about the customer’s wishes, they can create a tailor-made offer: a hotel that is best for them! Of course, if you don’t play this game and allow the OTA a good commission on this extra service, you will not be one of the suggested hotels. We don’t want to wait until online blackmail will be proven, so here are our five bullet points to start your new strategy. Outsmart the OTA’s and join the online game. 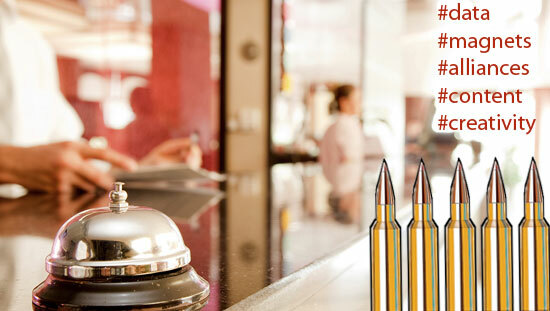 Defend your hotel and win guests back where they belong; via your website in your hotel room! Data is everything in a digital world. Yes, you have an e-mail address and their credit card number. But is that relevant for the future? Not really. Invite them to a digital community and give them the opportunity to become ambassadors. Trade some extra service in return for data. How big is your family; do you know friends that would love this hotel too? Would you like to get a voucher for a free stay, if you invite your friends and they actually book? If you get personal with your guest, you start a relationship. Simple database marketing starts with having your customer’s birthdays in a CRM system. Send a digital e-card or even better, a postal card. It puts you ‘top of mind’ and makes you a friend. With a proper database, you can start building and maintain the guest relationship. If people search for a hotel in any city, you know that Booking, Expedia, Trivago, Lastminute, Lastroom and all those other OTA’s are on the first positions in Google, Bing and Yahoo. If a guest found your hotel in the OTA site but wants to know more, they will try to find your own hotel website directly. They search for ‘your hotel name’ in let’s say ‘Oklahoma’. To ask something about your restaurant menu or opening hours of your spa. Or maybe a special family deal. And maybe even book directly. During this search, it’s crucial that your hotel website now pops up at least on the second page. Otherwise, you don’t exist. At least, not in the virtual world. To give extra power to your hotel’s name and your location, you need good ranking content on your website. And not in a blog, but on a fixed page in your website menu. These pages are the pillars of your website and important for Google. Write 2000 SEO well-balanced words about Oklahoma and your hotel, and Google knows that you know a lot about these two keywords. A simple way to become more visible when people search for something more than a good price. If you do the above in combination with weekly content marketing updates, you will crawl up in the search results. Until that time, be aware that people use other websites as well to search online. OTA’s dominate Google; that means you can easily take the #1 position in Youtube. Post video’s about your hotel, the services and of course reviews from your guests. Ask them to say something in front of the camera, and make a weekly compilation of this. Easy to do and worth a million. Use Twitter if people look for real-time events in your city. Are you having any? Make sure to share them on your Twitter Page and to use the power of the #hashtags. Explore the web and discover new networks where your guests hang out. Good photography is everything to sell your hotel online. Post your library in different groups on Pinterest and Instagram with appropriate tags. People will find your hotel there and can become a fan without being a guest. But at least, you create an audience and your pool to fish in. Without any OTA’s in the water. Of course, your hotel is the best place ever, but that’s not why people come to you. They come to you because of the location. And since you are there, the guests expect you to know everything about the area. Probably you do, and your front desk managers give brochures and tips. Make this info online available. Install an extra section on your website and write about the top attractions and experiences people can find in your city. Mention third parties and place a link to their website. Before you do this, contact all venues to exchange links; a very effective way to empower each other with a back-link. Back-links are becoming highly important for Google. If your website has back-links from other venues and websites in that same location; you’re seen by Google as relevant for that area keyword. Build alliances; don’t just distribute folders but exchange local links online. It will do your website and your knowledge reputation good. Hotel management has always been a calculating job; to find a good balance between services and costs to make a healthy profit. Being creative is not the hotelier’s priority; hotels have to be open and reliable. Still, you need some creative ‘out of the box’ thinking to make a fresh digital start. Invite some fresh eyes and sharp minds to find little gems in and around your property. Creative people can help you to find and validate them to use for a digital asset to re-launch your USP’s (Unique Selling points). With a little creative twist, simple services could become something special online. That’s good for your website, good for Google and important to inform the hotel guest. Finally, everything you do in the digital world has to be communicated in the real world. Advertize the best Selfie spot in front of your hotel, show your Twitter feed on a screen in the lobby and have some QR codes on your table stands to your new digital activities. Connect off-line with on-line; the best way to get synergy in your communications and sales. Let us know if this article helped you to get more direct bookings and share it wherever you can. Share the post "Five bullet points to get more direct bookings."